Is it true that seniors are divorcing in greater numbers these days, even after 40 years of marriage? That is the question many are asking and Press-Telegram helped clear the air by answering with a definite “Yes!” The article also revealed some interesting information and stats to prove it. According to a 2004 AARP survey over two-thirds of gray divorces are initiated by women. And once children are grown they are no longer a reason to endure an unfulfilling relationship. The probability of divorce following second marriages is two-and-a-half times more likely. The possible loss of financial stability. Loss of a partner’s support when health deteriorates. That, of course, is only true if a remarriage is not successfully contracted and there are no other family members to help. The article does mention that Baby Boomers – the ones who represent the largest numbers of seniors today – were the first generation to divorce and remarry in large numbers and makes the additional observation that that outcome was undoubtedly influenced, at least in part, by the fact that Boomers were the first generation to witness divorce as an acceptable norm. But, there is another important observation to mention. The Boomer era was also a time when the traditional home model – he earns the dough, she cooks it – was transitioning to a more flexible arrangement. Motherhood became less synonymous with Nanny-hood and took on a more multifunctional role. Like the wife in Proverbs 31, ladies began working and investing in many places other than the home. Ladies who married under the one income model felt unneeded and disengaged, with no place to go, once the kids moved on, not too mention unskilled and underdeveloped. The dissatisfaction became more intense with so many other wives finding fulfillment in outside-the-home activities. And the men weren’t always a help. Husbands stuck in the old model mindset often discouraged the wife’s working outside the home, and the personal development that goes with it, thus adding to the frustration. 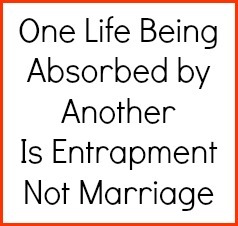 If that observation is correct then we need to redefine our understanding of marriage. Marriage is best understood as a partnership between two reasonably developed individuals, which encourages continued individual growth. It is never one life absorbing another. That approach is what stimulates the sense of entrapment. The traditional image of marriage – the horse bound night rescuing the damsel in distress – is a great fairy tale but has no counterpart in married life as we live it. It mirrors the age old idea that woman need saving and men are the saviors. The fact that most gray divorces are initiated by the ladies may suggest they are beginning to see the traditional model as the problem and in response are moving on. We shouldn’t be surprised. Ladies are patient, kind and forgiving. They aren’t mindless.